» PIQ x Five Points Fest exclusive 5" Dunny release!! To celebrate the inaugural year of The Five Points Festival, Clutter has partnered with PIQ to bring you not one, but two, resin Dunny designs to coincide with the installation of and amazing window display!. First up is the OctoDunny! Designed by Clutter's Josh Kimberg this design is a green triple-cast, GID octopus, trapped in a light blue transparent resin outer casing! 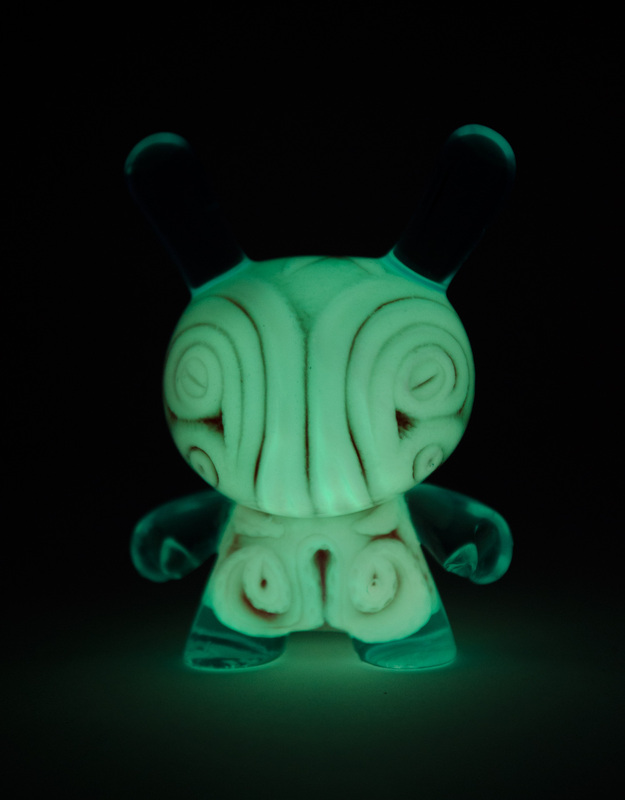 Limited to 25 pieces (in this early release green / GID colorway), this OctoDunny is positively radioactive! Also available is the 5PT's Logo Dunny! Limited to 25 pieces, and available in a multitude of colors, this double-cast Dunny celebrates the birth of a brand new home for our community in NYC!! Both figures will be available at PIQ Grand Central and PIQgifts.com starting at 5pm, today, Friday, May 12th. Josh 'Aka Deth Chops the Astro-psycho Physicist' Kimberg studied sculpture at NYC's famed NYU, and has been making monsters ever since. With a love of the grotesque, and coloring outside the lines, Josh has been around designer toys since the western movement was first conceived. With an Emmy-nominated background in animation, having a show optioned by MTV and winning an Art Directors Club award, Josh became a leading force behind Clutter in 2009, when his wife Miranda forced him to make peace with toys as art. The Five Points Festival is a collision of toys, comics, and counterculture curated by Clutter Magazine and presented by Midtown Comics. A designer toy and comic convention in New York’s Lower East Side, Five Points is two days and nights of comic artists and writers, vinyl and plastic toys, original art, resin, plush, blind boxes, graphic novels, indie comics, blanks, minis, kaiju, Japanese vinyl, posters, prints, apparel, food trucks, and craft breweries – capped off by the 2017 Designer Toy Awards. The antidote to the average con, Five Points brings tastemakers, misfits, and rebels together with the new, retro, and infamous in a one-of-a-kind marketplace.